UK County Councils (CC), London Borough Councils (BC) and Metropolitan Borough Councils (BC) appear to be reacting to growing concern over ongoing US product liability lawsuits involving agrochemical giant, Bayer (formerly Monsanto), and the world’s most popular glyphosate herbicide, Roundup. Glyphosate herbicides are commonly used in and around UK town halls and exposure has been linked with non-Hodgkin lymphoma (NHL) across the Atlantic. Bayer, alone, is facing upwards of 11,200 claims, but it remains reliant upon ‘four decades of extensive science and the conclusions of regulators worldwide that support the safety of our glyphosate-based herbicides and that they are not carcinogenic’. Official UK Government advice states that glyphosate is an important chemical for use in the agriculture and transport sectors, but evidence is in the process of being reviewed – politicians may be influenced to change their stance on glyphosate, e.g. by a French Administrative Court’s decision to cancel marketing authorisation for Roundup Pro 360, in January 2019. Regardless, as common knowledge of a possible carcinogenic association increases, public bodies and private companies may be expected to take preventative steps to avoid breaching their duty of care owed to affected workers and the general public. Since then, we reported (here) on the 2nd and most recent case of Edwin Hardeman,[iv] in which Bayer was ordered to pay more than $80 million in damages for negligently causing a Californian man to develop cancer. ‘In the light of this ruling, we are looking into the implications of HCC’s use of glyphosate-based weedkillers. Given their widespread use nationally, we also await and expect further guidance from central government’. Elsewhere, Wirral and Norwich CC’s have expressed a desire to phase out use of chemical weedkillers on playgrounds, parks, kerbs, pavements and footpaths, with Wirral, specifically, ‘seeking ways to minimise the use of glyphosate for the future, by researching alternative weed treatments including non-chemical approaches’. Wirral CC may wish to monitor action taken in London, as Richmond BC commenced trials of non-chemical weedkillers earlier this week. Not all natural weedkillers are without their own issues, however. In some parts of the country, vinegar has been discounted as a result of its smell, boiling water has been considered too dangerous and mini-flamethrowers have fallen outside of insurance policy coverage. While communities deliberate how chemical herbicides can be replaced, the Amenity Forum and Dublin-based lobbyist, Red Flag, are backing glyphosate use. In 2016, the Amenity Forum, a group whose members include Monsanto and Bayer, convinced West Lothian CC to continue using glyphosate. At the time, it appeased anti-glyphosate petitioners by promoting the Forum as ‘a non-profit-making, independent body’, though Monsanto and Bayer have funded the organisation and written advice articles for its newsletter. According to Chairman, John Moverley, the Forum is currently running national events to spread the message that glyphosate herbicides are safe and cheaper than substitute agents. He warned that ‘if [councils do switch] residents [will need to be notified] that the costs of managing the weeds will significantly increase’. Elsewhere, Red Flag has been employed by Bayer, having previously helped farmers to oppose an activist-led campaign to ban glyphosate EU-wide. According to Red Flag’s Chief Executive, Karl Brophy, the campaign flew ‘in the face of science, the position of all relevant EU regulatory agencies and the position of the European commission’. Medical testing identified toxic chlorobenzene in his body. 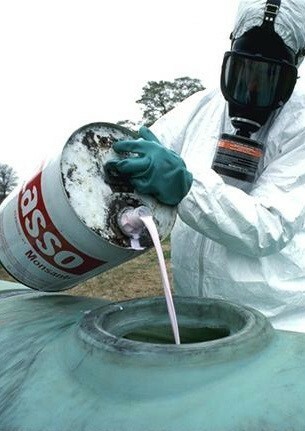 The active ingredient in Lasso is alachlor (monochlorobenzene-based) – it is not a glyphosate-containing herbicide, like Roundup. Nevertheless, Lasso was banned in France, in 2007. [vii] It had already been banned in Britain, since 1992. Bayer was immediately ordered to pay the claimant’s €50,000 legal fees, but no determination was made on quantum. At a forthcoming Lyon Court hearing, judges will consider an appropriate compensation award – Mr. Francois is seeking damages in the region of €1 million (£860 million). However, Bayer is currently reviewing the judgment on liability and considering launching another appeal, irrespective of the fact that Monsanto had already failed to appeal the 2012 ruling on Mr. Francois’ claim, in 2015. Will this latest judgment put more pressure on the French Government to phase-out glyphosate herbicide use before 2022? Only time will tell. [ii] Gabrielle Garton Grimwood, ‘Glyphosate: Controversy surrounding the EU's re-approval of the pesticide’ (27 June 2017 House of Commons Library) <http://researchbriefings.files.parliament.uk/documents/CBP-8066/CBP-8066.pdf> accessed 15 March 2019. [iii] Robert Booth, ‘UK councils assess weedkiller use after US cancer court case’ (5 April 2019 The Guardian) <https://www.theguardian.com/society/2019/apr/05/uk-councils-weedkiller-cancer-link-monsanto-roundup> accessed 8 April 2019. [iv] In re: Roundup Products Liability Litigation, MDL 2741, U.S. District Court, Northern District of California (San Francisco). [v] Alva and Alberta Pilliod v. Monsanto Co. (Case No. RG17862702, JCCP No. 4953). [vi] ‘Monsanto loses appeal in French farmer's poisoning case’ (11 April 2019 Daily Mail) <https://www.dailymail.co.uk/wires/afp/article-6912517/Monsanto-loses-appeal-French-farmers-poisoning-case.html> accessed 12 April 2019. [vii] ‘Monsanto liable for French farmer’s ill health’ (11 April 2019 BBC) <https://www.bbc.co.uk/news/world-europe-47894414> accessed 12 April 2019. [viii] Simon Carraud and Catherine Lagrange, ‘French court finds Bayer's Monsanto liable for farmer's sickness’ (11 April 2019 Reuters) <https://www.reuters.com/article/us-france-monsanto-lawsuit/french-court-finds-bayers-monsanto-liable-for-farmers-sickness-idUSKCN1RN1JA> accessed 12 April 2019.